NEW YORK — Americans were commemorating 9/11 with somber tributes, volunteer projects and a new monument to victims Tuesday, after a year when two attacks demonstrated the enduring threat of terrorism in the nation's biggest city. Margie Miller was among the thousands of 9/11 victims' relatives, survivors, rescuers and others who gathered on a misty Tuesday morning at the memorial plaza where the World Trade Center's twin towers once stood. She came to the site from her home in suburban Baldwin, as she does 10 or so times a year, to remember her husband, Joel Miller. Only a few fragments of his remains were recovered. "To me, he is here. This is my holy place," his widow said before the ceremony began a moment of silence and tolling bells at 8:46 a.m., the time when the trade center was hit by the first of two terrorist-piloted planes. Victims' relatives who had brought signs bearing photos of their loved ones wordlessly held them high. President Donald Trump and Vice President Mike Pence headed to the two other places where hijacked planes crashed on Sept. 11, 2001, in the deadliest terror attack on American soil. © The Associated Press A woman leaves flowers at the North Pool during a ceremony marking the 17th anniversary of the terrorist attacks on the United States on Tuesday, Sept. 11, 2018, in New York. 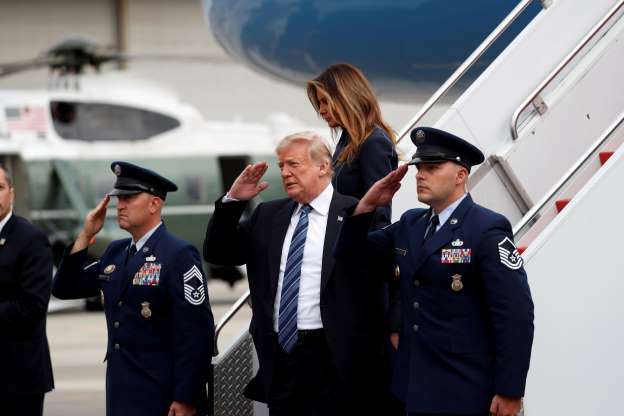 (AP Photo/Mark Lennihan) The president and first lady Melania Trump flew to Pennsylvania to join an observance at the Sept. 11 memorial in a field near Shanksville, where a new "Tower of Voices" was dedicated Saturday. Pence is attending a ceremony at the Pentagon. Trump, a Republican and native New Yorker, took the occasion of last year's anniversary to issue a stern warning to extremists that "America cannot be intimidated." Nearly 3,000 people died in the attacks on 9/11, when international terrorism hit home in a way it previously hadn't for many Americans. Sept. 11 still shapes American policy, politics and everyday experiences in places from airports to office buildings, even if it's less of a constant presence in the public consciousness after 17 years.A stark reminder came not long after last year's anniversary: A truck mowed down people, killing eight, on a bike path within a few blocks of the World Trade Center on Halloween. The recent attacks in New York, as well as terror attacks elsewhere, were on Miller's mind as she arrived Tuesday. "You don't want to live in fear, but it's very real," she said. Debra Sinodinos, who lost her firefighter cousin Peter Carroll and works near the trade center, said she tries not to let the recent attacks unnerve her. "You have to move on," she said as she headed into the anniversary ceremony with her extended family. "Otherwise, you'd live in fear." The names are read by victims' loved ones, some of them not yet born when the attacks happened. "Even though I never met you, I'll never forget you," Isabella Del Corral said of her grandfather, Joseph Piskadlo.